Property 1: Amazing views of Kachemak Bay and Cook Inlet from modern, new cabin. Marvelous Dry Cabin In Homer, AK! Property 2: Marvelous Dry Cabin In Homer, AK! Alaska's Premiere Executive Vacation Cottage! Property 4: Alaska's Premiere Executive Vacation Cottage! Property 5: First Class Yurt with Everything. Perfect for couple or family. View! Location! Property 9: Cozy cabin in the sky! Alaska's Only Bed & Dessert! Property 10: Alaska's Only Bed & Dessert! Cedar Sun Dry Cabin - Great deal right in Homer! 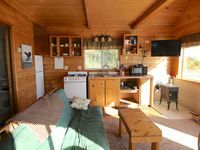 Property 12: Cedar Sun Dry Cabin - Great deal right in Homer! Property 15: Gorgeous Suite With Incredible Views & Private Hot Tub! 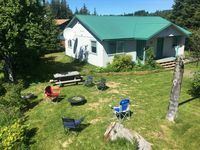 Property 16: Alaska's Premiere Executive Vacation Cottage! Cozy Cottage In Town With A View! Property 17: Cozy Cottage In Town With A View! Property 18: Gorgeous Suite With Incredible Ocean/Mountain Views & Private Hot Tub! Perfect location for Charters, Family Vacations or even your Beach Wedding. Property 27: Perfect location for Charters, Family Vacations or even your Beach Wedding. Property 33: Enjoy our Dry Cabins in Homer, Alaska! Whalesong, Highliner House Cottage, High Atop West Hill, Amazing View!! Property 40: Whalesong, Highliner House Cottage, High Atop West Hill, Amazing View!! Property 44: Moose Den Highliner House Cottage High Atop West Hill, Amazing View! The directions were easy and clear. The space was clean and very comfortable. Towels were soft and everything was great. The whole process was easy. The location is perfect, too. You're close to ski trails and beautiful views as well as a short drive to great food and the life of Homer. I would stay here again and recommend to anyone. The cabin was all we could ask for and the view of the bay and the homer spit was great.Debbie was friendly and helpful. Thanks for sharing Debbie!